Some time ago a friendly fellow, who runs the site http://www.lowemfoffice.com/, made a monitor for me that not only looks nice but radiates much less emf than usual. I thought a few people might be interested in hearing about it or in his website, which contains some simple and valuable tips and basic information that may help to reduce emf around the computer-desk. The monitor has an external DC linear power-supply with a smooth current, reducing flickering as well. The refresh-rate is still present of course, and it emits some emf, but hardly any under 100 KHz. 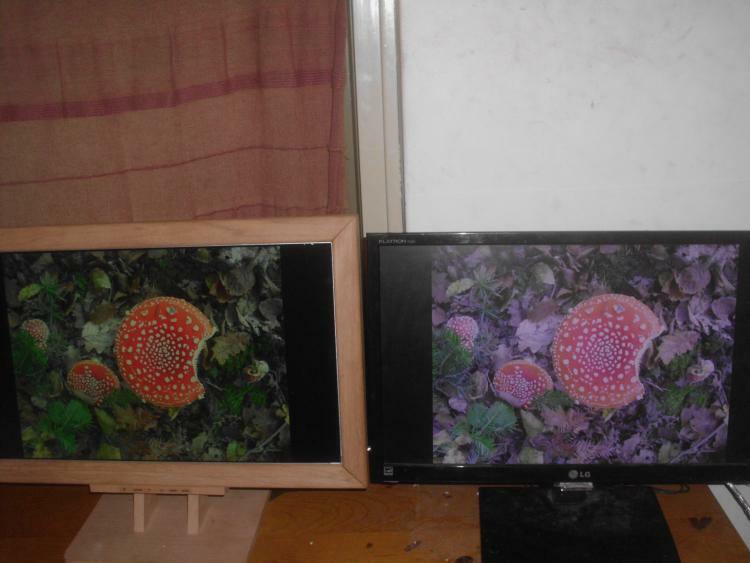 The attached picture compares the monitor with my old one, both have LED backlights. Although it may depend on the display on which it is seen, the difference is clearly large. In case this means anything to you, the CRI and the R9 are both about 97 ( out of 100 ), the colours resemble natural light extremely well, that is : compared with LEDs in general. I plan to still get an optical usb-cable for the keyboard and mouse, but without this and optical video- and ethernet-cables as well i already feel much more comfortable while using the monitor versus a number of regular ones. Of course OLEDs would be an improvement, perhaps in a few years the backlights could be replaced, as everything is developing, however it helps me to reduce emf related stress substantially now, as sitting behind a computer appears to be a main cause, even within the city where electro-smog is getting from bad to worse. sitting behind a computer appears to be a main cause, even within the city where electro-smog is getting from bad to worse. I had kind of the same experience - I could mostly tolerate the discomfort of ES, but using a computer for a long time would make me agitated and distracted. Have you continued to use this monitor? How has it worked out for you. I'm in desperate need of a new monitor. My old VGA one is dying. The one time I tried a flat screen monitor (10 years ago), I got dizzy so I haven't tried any since. This one sounds like a possibility. Do you think I could get one, and if so, how would I go about doing that? ESther, I assume you were asking earthworm about the monitor, and not me (Marc) ? I'm using a 28" BenQ monitor at home, and it's workable for me... I actually purchased & rejected 6 other monitors before settling on it. Model is "GW2870H". BenQ also sells a "GC2870H", which I have not tried. Oops, I guess I was asking earthworm about that particular monitor, but I certainly appreciate your reply about the BenQ monitors. I'd like to ask you another question. Years ago I found that flat screen monitors made me dizzy, as do flat screen TV's. I've assumed it's because I "see" the movement of the pixels. (Don't know how to describe it actually, but I've heard of other people experiencing the same thing.) Has anything like that factored into your intolerance of some of the monitors you tried? I've been using a CRT monitor all these years, but it's nearly impossible to get one (used, of course) these days. I'm wondering if the newer LCD ones have improved so the dizzying aspect wouldn't be a factor now. I'm homebound so I can't go to a store to look at any, but perhaps someone who got dizzy with the older ones, but doesn't now might have some comments? Esther, I don't know if this pdf will attach in Nabble, if not search "Subliminal Flicker - TheEIWellspring" as it may be of interest to you. The author is Richard Conrad, a physicist and inventor, who became ES while trying to invent a flicker-free screen. He describes the various problems with CRT and LCD screens and how they might affect a person. > it's because I "see" the movement of the pixels. Esther, I don't think that was what I was reacting to, so I cannot comment on that. some that are not so bad for me. > "Subliminal Flicker - TheEIWellspring" as it may be of interest to you. > problems with CRT and LCD screens and how they might affect a person. Also, there are LED backlit LCD monitors that don't have any flicker in the backlight, even when dimmed. Both my monitor at home and at work are such monitors. These may be more tolerable than the usual monitors that have LED backlight flicker when dimmed. "I notice that when I do a lot of text and web browsing on 60hz I get eye strain and a bit of motion sickness sometimes. As soon as I go to 120hz I feel like a "relief" on my eyes and brain." Switching to an OLED screen might be another way to improve things. I was just in a computer store (something I avoid) and noticed that they were a lot easier for me to look at than an LCD. > 120hz I feel like a "relief" on my eyes and brain." And I have the exact opposite problem... higher refresh rates have historically been worse for me, especially if that means the video source is sending through more data to accomplish those rates. Does it help you to use a specific type of cable? > Does it help you to use a specific type of cable? It does help me to use a VGA connection... also my VGA cables are typically triple-shielded and with dual ferrites. here is earthworm, sorry for the delayed responding. yes i still use it, it is one of the sixth generation. so far i could not cope with any other tested monitor for hours at a time. the emfs are also measurable much lower. you can write to mail@lowemfoffice.com with any question, the guy is really friendly and professional. the rounded monitors are CRT's and produce some very strong fields. flatscreens are either old LCD's with fluorescent backlights or modern ones with LED backlights. the low-emf monitor has LEDs, for most electro-sensitive people that is the best option. this type of light is hard on the eyes though, in a few years OLED monitors are probably preferable in this regard. for those who have a landline phone connected to an adsl-modem : ground the modem ! otherwise enormous electrical fields ( at a low-frequency ) will emit from the phone. usually there is an usb-socket in the modem, then just stick an usb-cable into it. the outside metal of the plug on other end ( or the wire connected to it ) is to be grounded.